Having reviewed many options, our overall winner is Nike. The combination of durability, style, and comfort make Nike cleats a joy to wear. This is undoubtedly why Nike cleats are the cleat of choice for so many professional athletes. Unfortunately, Nike cleats don’t come cheap. As with most things, however, you get what you pay for, and this is definitely the case when it comes to Nike. Furthermore, Nike has a wide range of options that cater to different player preferences. This way needn’t compromise. You can be sure you’ll get exactly what you’re looking for. The Adizero Afterburner V is said to be the lightest baseball cleat ever made. And it also looks pretty amazing. What makes the Adidas Adizero Afterburner V so lightweight? Well, that’s because Adidas set out to make a lightweight cleat using the lightest materials, but without compromising comfort or longevity. This cleat uses a synthetic upper, a new Sprintframe plate, a mesh-anchored heel and tongue and lastly, a Litestrike EVA midsole – This is one of the main reasons it wins the “lightest baseball cleat” award. This midsole is by design made to be lighter than competing cleats. These lightweight cleats don’t come at the expense of grip. The waved design of the cleats enhances grip and dirt penetration, so these cleats grip exceptionally well. With this in mind, it’s difficult to choose a worthy competitor for the title of lightest baseball cleat. However, the Nike Lunar Trout 2 gives the Adidas Adizero Afterburner V, a run for its money. A Lunarlon foam midsole for a comfortable but responsive experience. A mesh upper for a lightweight experience & breathability. A nine-cleat build for greater traction and durability. Of all the pairs we’ve reviewed, we think the clear winner is the Mizuno 9-Spike Advanced series. For starters, the Mizuno 9-Spike is affordable. When buying youth gear, the price should be one of the first things you consider, because your kids will grow out of their gear before you know it. For this reason, you shouldn’t break the bank. Additionally, Mizuno makes high-quality baseball gear. The Mizuno 9-Spike baseball cleats are no different. The 9-spike comes in a wide range of sizes and variations for all age variations. This works for us because it means your young one can grow with the same cleat brand and style without needing to switch to a new cleat brand that feels different once they outgrow the 9-spike. Coming in at number to for the title of best youth baseball cleat is the Adidas Wheelhouse 3. This is an affordable pair of cleats that not only looks great, but also gets the job done. Young baseball players often want to look cool, so they will definitely love the digital camo pattern. Their only drawback is their fit – If your young one has a wide foot, they may not fit comfortably. The best molded baseball cleats category also has a clear winner: the Under Armour Ignite. Molded cleats are made out of plastic and have rubber studs. They and are very popular in youth leagues for this reason. The rubber studs are safer to play in when sliding and running the bases. Molded cleats are quite durable and should easily last you the entire season. They also get good traction on many different surfaces. Their only drawback is that digging into the ground if you’re playing in thick grass is difficult. From our reviews, the winner is the Nike Huarache 2KFilth Pro Mid, the Adidas Adizero Afterburner 2.0, and the New Balance Low-cut 3000v3. These cleats provide the best traction for quick plays on the field. One of the best turf cleats in this section is the Mizuno Players Trainer Turf and New Balance T4040V4. They are both premium cleats made from synthetic materials & a rubber sole and designed to provide excellent traction, stability, comfort, and performance. Baseball and softball cleats have evolved significantly over the past few years. Manufacturers have made significant strides in keeping players safe from injury and making cleats that are much more comfortable and durable. The right cleats should give you the comfort, and traction you need to make quick, explosive movements, and the support you need to avoid injury. You should never walk into a store or visit a website and pick up the first thing you find. There are lots of factors to keep in mind. Our buying guide will help you narrow down your choices and pick out the best one according to your budget and needs. There are four main types of baseball/softball cleats; molded, metal, turf and interchangeable cleats. At one point, these were the only cleats you could buy. However, the options have grown. That said, metal cleats are still some of the best baseball cleats you can buy. Metal cleats offer the greatest traction because they are thin and can effectively dig into dirt or thick grass better than plastic cleats. They are also lighter than other cleats. They are very popular in collegiate and professional leagues. Unfortunately, metal cleats are quite dangerous, especially in sliding plays. For this reason, they are banned in some youth and amateur leagues, so be sure to check whether your league allows them before you make a purchase. Metal cleats wear out when used on turf, and aren’t ideal for use in surfaces other than grass or dirt. Molded cleats are also extremely popular in baseball/softball. They make up a huge chunk of all the cleat purchases today because they are designed for safety, are versatile and durable. 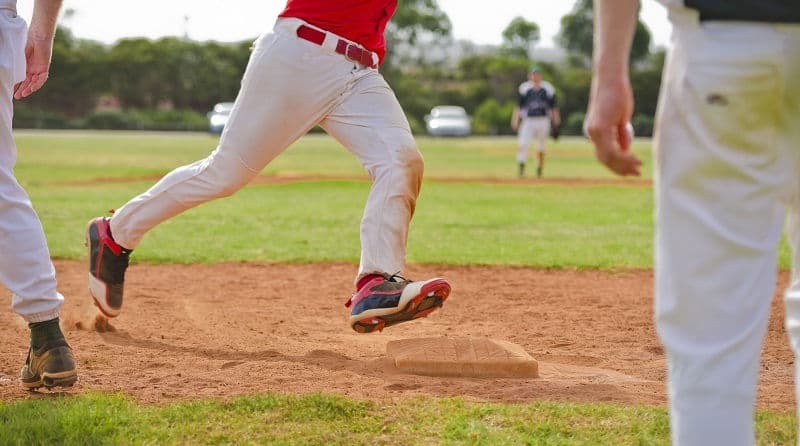 They are especially popular in youth leagues and are required for players below the age of 13 years of age due to the safety issues posed by using metal cleats while sliding and running the bases. Their versatility allows them to be used on many different surfaces. Their only drawback is that players may have trouble digging in if the ground is too compact and dense. In such cases, metal cleats are the best option. The popularity of turf cleats has grown over the years. Turf cleats are mainly worn during training sessions because they are a lot more comfortable. While they don’t offer as much traction as molded or metal cleats do, they are a great choice. Additionally, they won’t ruin the training facility as metal cleats would. Baseball players typically do not wear turf cleats during play, but these cleats are popular with slowpitch softball players because they provide enough comfort to withstand all-day tournaments. Interchangeable cleats give you the option to use either metal cleats or molded cleats. These can be swapped-in as you see fit, in-line with the field’s condition or the league’s rules. The cleats are attached to the shoe via a screw, and can easily be changed. This convenience and versatility make interchangeable cleats a reliable option to consider. However, they tend to be heavier than other types of cleats. You are invariably going to notice that different cleats have different designs – High-cut & low-cut cleats. While there aren’t apparent advantages or disadvantages, the option you choose largely depends on personal preference. For instance, choosing one option over the other depends on how much mobility and ankle support you want. Low-cut cleats are best for a faster, more agile player (basically a player who isn’t a lineman). This is because low-cut cleats are lighter, less restricting on their ankles, and allow for a much higher range of motion. The major downside is that because low-top cleats don’t offer a lot of ankle support, so you’re much more likely to roll your ankle while playing in them. Tape up your ankles before a game. This lowers the risk of injury, and tape can get loose enough to still allow for an adequate range of motion. If cleats you’re looking to buy feel flimsy or cheap, do not buy them – they can be a cause of severe injuries. High-top cleats provide the best foot support especially when a player is moving laterally. They are ideal for players who need more ankle support perhaps due to ankle problems. Also, they are heavier than low-cut cleats owing to the additional material used. Hi-Top cleats, however, are mostly used by linemen, who need a strong and sturdy shoe. They do not travel far on during plays so the additional weight shouldn’t be much of an issue. They limit the range of motion so that players don’t misstep or worse, twist an ankle. Just because high-top cleats restrict the range of motion doesn’t mean that they are super stiff. They are meant to be flexible where it matters, but not too much. The material your baseball/softball cleat is made out of is essential. It determines the weight of the cleat, as well as the durability. Traditional baseball/softball cleats are made out of either genuine or synthetic leather. Synthetic leather cleats come at an affordable price, are comfortable, and are your best bet in wet and muddy field conditions. Genuine leather, on the other hand, is a lot more durable, feels softer and more premium, and is a lot more breathable, which keeps players feet fresh, dry and comfortable. This added quality also means that genuine leather baseball cleats carry a heftier price tag. Price is an essential factor when it comes to picking out the best cleats. Factors such as brand, material, and construction all play a role in how cheap or expensive the cleat is. It is always a good idea to begin with a budget in mind when shopping for your ideal cleats. Cheaper cleats are okay in amateur or youth leagues. In the more competitive leagues, you may have to shell out a bit more money to get the highest quality. As a rule of thumb, stick to tried and tested brands. Choosing cheaper unknown brands almost always ends badly. Reputable brands have a wide variety of cleats available to suit any kind of player. Reputable brands are also continually refining their cleats and releasing newer models, so you’re sure to find something that fits your needs and your budget. Some of the top brands are Adidas, Under Armour, Nike, Mizuno, and New Balance. They are ideal for players who need more ankle support perhaps due to ankle problems. They are heavier than low-cut cleats owing to the additional material used. However, Hi-Top cleats are mostly used by linemen, who need a strong and sturdy shoe. They do not travel far on during plays so the additional weight shouldn’t be much of an issue. They limit the range of motion so that players don’t misstep or worse, twist an ankle. However, just because high-top cleats restrict the range of motion, they aren’t super stiff. They are meant to be flexible where it matters, but not too much. One other factor you need to take into consideration is the position you’ll be playing in. Each position requires a specific type of cleat to enable the player to thrive. Infielders – Here, you need to take the surface of play into consideration before you make a choice. For instance, if you’re playing on a soft, muddy surface, avoid plastic cleats as they tend to hold chunks of dirt, making it difficult to move around. For such surfaces, metal cleats are better as that provide that extra traction without digging your feet in. Outfielders – Metal cleats are ideal for outfielders. They help outfield players plant their feet firmly in and out of the grass when reaching for fly balls, for instance. Another significant benefit is metal spikes don’t pick up chunks of grass like way molded cleats do. Pitchers – Pitchers need cleats that offer excellent traction and stability. For this reason, metal-studded cleats are often the best option for pitchers. Metal cleats provide adequate traction for the pitcher’s push-off foot, providing much-needed grip. Catchers – Catchers need to be quick and agile on the pitch. For this reason, catchers need to wear the lightest baseball cleats to leverage the benefit of speed, and agility. Sizing a baseball cleat is quite similar to how you would size a regular sneaker. The only caveat is that you need to wear athletic socks as you try out your brand new baseball cleats. Having the right socks will help you get a feel of how your cleats will feel on game day. You’ll want your cleats to fit snugly to keep your feet from moving around in the cleats as this may eventually cause blisters. Once your cleats are fully broken in, however, they will fit perfectly. Sizing cleats for a youth player can get tricky. Parents (I’ve been guilty of this myself) want to buy footwear that’s a few sizes larger because their children quickly outgrow them. However, for the best fit, the pair you buy should never be more than half a size larger (enough room for a finger at the heel of the shoe). When buying cleats for your child, we recommend buying cheap baseball cleats. They are the best option for your child since they are always growing. Buying the best baseball cleats is one thing. Keeping them in tip-top shape to extend their life is another. Ensure to clean your cleats after every game. Clap them together to get rid of loose dirt, and if they are muddy, wait till the mud dries up then use a stick to chip away at it. Finally, use mild soap & a soft cloth to wash them then let them dry at room temperature. Only wear your cleats when you get to the dugout. Walking around in them on asphalt or concrete may cause them to wear out prematurely. Air your cleats out after every game to prevent the build-up of moisture, which could lead mold. If you are a pitcher, look for baseball cleats that have a reinforced toe. Pitchers often drag their back foot, which may cause their cleats to wear out sooner. If you can’t find a cleat with a reinforced toe, look for accessories that can be fitted to the heel of the cleat. Store your cleats in a warm, dry space. Avoid leaving them in places that may get too hot, e.g., in your garage or in your car as this may damage them or reduce their lifespan. If you have metal cleat, pay close attention to the studs – Check them for any indication of rust, & replace any studs that are missing or broken. The best baseball cleats are ideal for a better experience on the field. Your cleats can be what spurs you on to victory, or a recipe for a painful loss. Hopefully, this detailed guide will help you pick a pair that’s comfortable, provides sufficient traction and enough flexibility to move around quickly.